The exhibition by Ukraine documentary photographer Alexander Chekmenev comprises work from two decades –1993 to 2014. It is dedicated to the Donbas region in Eastern Ukraine, the part of the country the artist comes from and knows best. The Donbas region is primarily a mining and industrial area. Life has been more difficult for the people of the Donbas region since the collapse of the Soviet Union in 1991. The photographs on exhibition here shed light on the living and working conditions of that area. The images included in the exhibition represent six Chekmenev’s projects and are divided into three thematic groups. Passport (1994 – 1995) depicts elderly or incapacitated people being photographed at their homes for new passports after Ukraine gained independence in 1991. Donbas Miners exhibits images from coal-mining, the region’s most widespread occupation. Donbas 35 (1994-2015) and Donbas 6x6 (2000-2012) series (taken on 35 and 60 millimeter film, respectively) tell the story of people self-employed in this mostly illegal and dangerous spine-breaking manual labor. 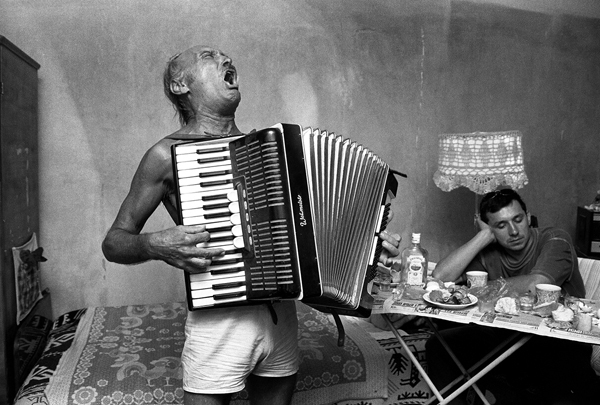 The last group of images, Luhansk 1990s, showcases a gallery of typical street characters from his hometown Luhansk. Black & White Luhansk (1993-1999) and Street People (1994-1999) are included in this portfolio. The Sodom and Gomorrah essay by the curator Igor Manko elaborates on the history and post-Soviet realities that supported the separatist uprising in this region. The essay explains why Alexander Chekmenev’s imagery provides “the missing link” that helps understand the social and economic contexts that led to the spring 2014 separatist movement.